Series PXXXVD, PXXXVDA and PXXXVDG preamplifiers have been designed for the most demanding commercial and military applications. Each model has been optimized for the lowest noise figure consistent with excellent strong signal handling capability. These preamplifiers are suitable for use in any receiver or converter/receiver system. Each preamplifier is housed in a rugged low profile custom aluminum enclosure finished with military grade black urethane enamel. Female BNC coaxial fittings are provided for the input and output connections. Other connectors or connector combinations are available. Complete rf shielding is maintained with a feedthrough capacitor for the dc power connection. Mounting holes, suitable for #4 hardware, are located at each corner of the bottom plate. 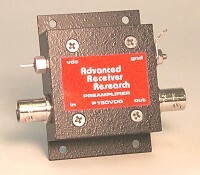 Several models of preamplifiers are available for most frequency ranges. Selection of the most suitable model for a particular application will depend primarily on the noise figure and overload characteristics required. Preamplifier models using dual-gate MOSFET and bipolar transistor devices (part numbers with suffix VD or VDA) are suitable for most scatter, tropo, satellite, ATV, repeater and radio telescope applications. Gallium arsenide FET (GaAsFET) preamplifiers (part numbers with suffix VDG) provide the lowest noise figures and highest immunity to overload of any preamplifier types. These preamplifiers would be well suited for very low signal level work, either terrestrial or earth-moon-earth (EME) communications, or in areas where strong signal levels are normally a problem. Special attention has been paid to power supply transient protection and destructive gate voltage charge protection in the GaAsFET preamplifiers. Extensive testing of these preamplifiers on existing communications systems indicate that a signal-to-noise improvement of 6 - 14 dB can be expected. Each and every preamplifier is precision aligned on our noise figure measuring equipment and should provide long trouble free operation. All preamplifiers are designed to be powered by a 10 - 16 volt dc source with a current consumption of 25 mA. Low power consumption along with the small size make these preamplifiers ideal for installation within existing equipment or systems, or for remote mounting at the antenna. Mounting the preamplifier at the antenna will provide the best system noise figure.